It's dark. The sun is rising. The dark orange glow glistens over the desert, making it look mildly serene yet eerily daunting too. In the distance multiple rock formations of varying heights and sizes are towering into the sky. This is Monument Valley, a vast expanse of desert with little to no life to be seen anywhere, just dirt, mud and gravel as far as the eye can see. The sun continues to rise, revealing the rock formations in their majestic, gigantic beauty. Down on the ground a dirt bike and a buggy are speeding along a dirt track below, weaving in and out of a few camper vans. More rock formations pass by as our helicopter flies above and then over them. Then, it hits you; flags, flashing lights, cars parked down below, crowds surrounding a stage, crowds watching cars circle around small dirt tracks as well as watching bikes performing jumps and stunts -- there's clearly an event happening here, deep in the desert and boy is it packed. The above paragraph is a rough description of the opening clip of Evolution Studios' PlayStation 3 launch title and is, quite possibly, one of the best introductions to a game I have ever seen. It begins with a slow and subtle tour of a largely desolate, yet awe-inspiring stretch of desert with wondrous rock formations towering all over the lifeless ground below. It ends with the complete opposite, a loud and proud convergence of man, machine and spectacle. It hints that something is happening before ramming it in your face and you know what? It instantly puts you in the mood to play. This continues as you reach the main menu where, over a PA system you hear someone yell "Welcome to MotorStorm" followed by the sound of the crowd cheering. Immediately afterwards one of the game's licensed songs begins to play -- in my case Slipknot's Before I Forget and then Pendulum's Slam -- coinciding with further footage in the background of cars racing, tumbling down a hill, bikes going over jumps, people walking between tents, crowds cheering for a band playing live and even a damaged car being towed. It's an overwhelming introduction but within minutes you are motivated to play, inspired to race and have a desire to be part of this spectacle of an event. The fact the introduction can get you excited to play is significant -- How many games can get you into the mood to play them within minutes, hell, seconds of you putting the disc into the drive? It's a good feeling. This continues as you start playing, with the racing in MotorStorm being thoroughly enjoyable and even strategic as you realise that the game's various tracks contain multiple routes, each suited to certain types of vehicle. Speaking of which, there's a good variety of them ranging from bikes and rally cars to racing trucks and big rigs, each handling differently and being a joy to drive. 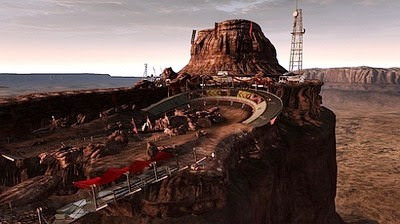 There are jumps, pools of mud, ditches, car junkyards and other obstacles all over the tracks, some of which are set high on mesas with their routes running parallel to the cliff side, the sharp drop and expansive desert totally visible below. It's thrilling, intense stuff and an absolute blast to play. I enjoy all my racing games for various reasons, but it's not every day that I enjoy one simply because it is fun. The last time that happened was with Burnout Paradise and that came out in the beginning of 2008. It may be a launch title, it may have a sequel set elsewhere and it may not be as popular as other well-known racing franchises, but MotorStorm is a fantastic arcade racing game that is really fun to play. If you like arcade racers and you own a PS3, it comes fully recommended from me. I will be back soon to delve deeper into why it's so fun to play as well as discuss other elements not mentioned here, but for now please excuse me. I have a date with the desert to attend to. Brilliant post, and I wholeheartedly agree.